Each month, the Sharp End brings to life stories from the pages of Accidents in North American Climbing, the annual publication of the American Alpine Club (AAC). Host Ashley Saupe interviews the climbers, skiers, and rescuers involved in life-threatening incidents and shares their lessons, helping all of us become safer climbers. Join the more than 34,000 climbers who listen to the Sharp End by following on iTunes, Spotify, Soundcloud, Google Play or Stitcher. New episodes are shared the 1st of each month! The Sharp End is presented by Mammut, with additional support from Colorado Outward Bound School and Suunto. Additional sponsorship opportunities are available. Write to us for more information. Fans of the Sharp End can support the show directly with a donation. Follow this link and choose “Sharp End Podcast” in the drop-down menu of fund options. All proceeds will help this podcast thrive and grow. Thank you! Accidents in North American Climbing is published each August and delivered free to AAC members (Join the AAC). Not a member? You can order the Accidents book and/or get it on your Kindle. The Sharp End's "Play Hard & Be Smart" T-shirts are available here. Share your story: Would you like to be interviewed for the Sharp End? Ashley is always looking for people with interesting and educational stories. Ashley came to the AAC in November 2015 with her idea for the Sharp End podcast. As a longtime outdoor educator, she was already involved in accident prevention and was fascinated by the stories in Accidents in North American Climbing. And as someone who lives on the road, she craved high-quality audio for those endless drives. Share your own story: Email Ashley to get started. Denali mountaineering ranger and flight medic Dave Weber returns to the Sharp End to discuss the ins and outs of calling for a rescue: when to do it (and when not to), how to make the call and what to say, and how to prepare for a helicopter rescue. Dave has appeared twice before on the Sharp End: Episode 4, discussing an accident in the Ruth Gorge and a day in the life of a Denali mountaineering ranger, and Episode 22, in which he describes three simple but very effective ways to prevent or survive climbing accidents. This episode also describes the American Alpine Club’s rescue benefits, which include up to $12,500 that may help reimburse backcountry rescue expenses. The AAC’s Trailhead Rescue benefit, provided by Global Rescue, requires notifying Global Rescue as soon as possible in a backcountry emergency. Here’s the number to call: (617) 459-4200. AAC members should keep this number handy whenever they head into the backcountry. Ice climbing in Michigan's Upper Peninsula can be seriously cold. In this episode, Ashley speaks with Jason Eicholtx about a midwinter adventure in the UP that went dangerously wrong as an ice climber collapsed with hypothermia. Plus, wilderness medicine specialist Dr. Bryan Jarrett explains how to prevent hypothermia and treat it in the field. This episode mentions a hypothermia wrap (a.k.a. burrito wrap or hypo-wrap). This short video depicts the creation of a wrap for warming and potentially carrying a hypothermia patient. Starr Jamison suffered the agony of watching a good friend die in an avalanche in Colorado. He was one of three friends she lost to avalanches in a single year. In this episode, Starr describes the first accident and the painful, disorienting aftermath, how she recovered, and how she's working to help others deal with similar experiences. When climbers, skiers, and other backcountry adventurers have an accident, they often aren't the only ones to suffer an injury. Partners, rescuers, and witnesses at the crag can feel the affects of "stress injuries" for years to come. In this episode, Ashley speaks with Laura McGladrey, a mental health nurse practitioner and veteran health provider in wilderness and humanitarian settings, about the importance of psychological first aid for outdoor adventurers and rescuers. The American Alpine Club is helping to create a Climbing Grief Fund that aims to provide information, grants for counseling, and other resources to climbers struggling with the loss of a friend or partner. Experienced counselors interested in getting involved can email Vickie Hormuth to learn more. Want to contribute financially? Donations for the Grief Fund are being collected here. This episode was supported in part by Prival. Congratulations to Russ Congo, winner of a Partner Rock Rescue course from Prival in the contest featured in our October episode. Sharp End listeners can get a $50 discount on Prival’s Partner Rock Rescue course in Utah this November 7–10. Use the code SharpEnd50 when registering. Laura McGladrey nursing in Africa. Brad Carter had started up a very difficult climb at Index Town Wall in Washington state. In the first 50 or 60 feet, this route has three widely spaced bolts for protection. When Carter decided to rest at the third bolt, he got the shock of his life. This incident occurred almost a decade ago, but the lessons about bad bolts are extremely relevant today. A special offer for Sharp End listeners! On October 15, 2018, the Sharp End podcast will choose one lucky listener to join a Prival Partner Rock Rescue course in Utah totally free! (A $480 value.) All you need to do is listen to this episode and then comment on what you learned at the Prival or Sharp End Instagram page. A winner will be randomly selected from all of the comments on the photo from this episode. Can't wait to learn essential rock rescue techniques? Then use code SharpEnd50 at PrivalUSA.com for $50 off the October 4–7 rock rescue course in Utah. One of the bolt hangers that broke on the route Calling Wolfgang at Upper Town Wall in Washington. Patrick Stefanik and a friend headed to Clear Creek Canyon, Colorado, on a beautiful Saturday in April. Crowds at the busy Creekside area forced them to change their plans, and Patrick started up an unfamiliar 5.9. When it came time to lower from the anchor, Patrick's fun day out went very, very wrong. Mistakes while lowering from the anchors atop single-pitch climbs have become one of the most common causes of climbing accidents. In this episode, Ashley mentions a short article in the new edition of Accidents in North American Climbing with some simple steps to prevent this kind of accident. Find it here. Kris Nova and a friend were attempting Mt. Rainier's remote and difficult Liberty Ridge when a boulder pulled loose and sent her on a tumbling fall, badly injuring one hand. In this episode, Kris describes her preparation for the climb, what happened on Liberty Ridge, and what she learned about calling for help after a mountain accident. Climbing on the rocky lower section of Liberty Ridge, Mt. Rainier. Hans Florine was attempting his 110th ascent of the Nose of El Capitan in Yosemite Valley. He and a partner were doing the Nose in a Day (an elite climb), but were not attempting any speed records. Yet Hans still took a bone-breaking fall, despite all of his experience. Learn what went wrong for the man who literally wrote the book on climbing the Nose. Hans Florine (right) and partner Abe Shreve low on the Nose route of El Capitan. One of Florine's nurses with a copy of his book "On the Nose," detailing his long history with Yosemite's most famous climb. It was October 2017, and Alex Doria and Jonathan Wachtel were starting up a dream climb: the Regular Northwest Face of Half Dome, high over Yosemite Valley. Alex was in the lead on the third pitch, and he felt good. Too good, as it turned out. He ran it out a long way between protection, and just as he was getting ready to place his next piece, he lost his balance and fell. Alex, Jonathan, and Ashley discuss what happened next and the lessons they learned. Greg Smith was 10 feet above his last piece of protection on a moderate climb in Calico Basin, outside Las Vegas, when he fell unexpectedly. His only piece pulled out and he hit the ground. At least that's what his climbing partner tells him, because he has very little memory of the day. In this episode, Greg and Ashley talk through the accident and the painful aftermath. Find more details about this incident report in Greg's report for Accidents in North American Climbing. Ryan Bowie, 34, was ice climbing with a friend in the remote backcountry near their home in Tumbler Ridge, British Columbia. When Ryan set up a rappel from the top of a vertical ice wall, the highly experienced climber made a series of bad judgments, resulting in a terrifying plunge that could have ended a lot worse. In this episode, Ryan reflects on what went wrong that day. Ryan celebrates on top of Salt Falls. He rigged a rappel from an anchor to the left and redirected the ropes over an ice hump on top, so they would run down the ascent line. During the rappel, the ropes popped over the ice hump and he took a violent swinging fall. Ryan, who works as first responder, found himself in the unfamiliar position of patient instead of caregiver.. In October 2017, well-known climber Quinn Brett fell over 100 feet while attempting a speed ascent of the Nose of El Capitan. She now lives with paralysis. For this very special episode of the Sharp End, Quinn spoke with Ashley about her climbing, the accident in Yosemite Valley, and the painful aftermath in front of a live audience at the American Alpine Club's Annual Benefit Dinner in February. Steve Smith was glissading down from Aasgard Pass, gateway to the Enchantments in Washington State, when he plunged into a deep hole caused by a waterfall of melting snow. This was a dangerous mistake: Several hikers and climbers have died falling into this same hole. Steve is now the climbing education manager for the Mountaineers and owner of Experiential Consulting, a risk-management consulting firm for outdoor programs. In this riveting episode, he shares the many lessons from that day on Aasgard Pass. Scott Smith after escaping from the snow hole below Aasgard Pass. His climbing partner shot over the hole during a fast glissade, but Smith, following more cautiously, was not as lucky. 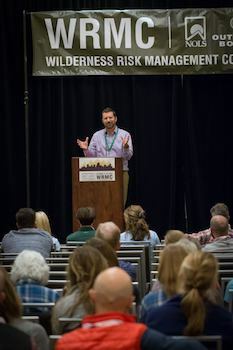 Scott Smith speaking at a gathering of the Wilderness Risk Management Conference. He was chair of the conference for three years. The Forest Service warning installed in the summer of 2017 after a series of accidents on the snowfield below Aasgard Pass. Japhy Dhungana, a Nepal-born, Colorado-based climbing guide, aspired to lead Evictor, a notorious 5.12 climb at the Rincon Wall in Eldorado Canyon. After rehearsing the route on top-rope and practicing the critical gear placements, Japhy made a lead attempt at the end of the day last March. When he let go near the top, Japhy expected take a long but safe fall. But that's not what happened. Japhy Dhungana after the fall. Back at work as a climbing guide. Belaying on a new route in Nepal. Photo by Zach Lovell. Tyler Smoker and friends were out for an early season tour near Hatcher Pass, Alaska, in November. He let down his guard for a moment and took a terrifying ride. Ashley and Tyler use their deep knowledge of backcountry snow safety to discuss what mistakes were made. The peak (left) where Tyler was avalanched. Riders' tracks and an avalanche crown are visible. Flight medic and Denali mountaineering ranger Dave Weber returns to the Sharp End to discuss the common themes he's heard in the first 20 episodes of this podcast. As he tells Ashley, there are three simple but profoundly effective lessons for preventing and surviving climbing accidents. Find this episode at iTunes, Soundcloud, or wherever you listen to podcasts. You can hear Dave's previous appearance on the Sharp End (Ep. 4) here: The_sharp_end – Denali-ranger-dave-weber-a-day-in-the-life. Mountaineering ranger Dave Weber (center) at work in Denali National Park. Photo by Menno Boermans. Craig Gorder, 28, and Kelsey Brasseur were attempting to climb all seven towers of the Bridger Jack formation in Utah in a single day. In midafternoon, as Craig started up the second pitch of Hummingbird Spire, their fifth tower of the day, he pulled off a huge sandstone block that crushed his body and cut his rope, leaving him dangling below Kelsey. In this episode, Craig describes the accident and the incredible rescue that followed. Read Craig's story about this incident in the 2017 edition of Accidents in North American Climbing. Find this episode at iTunes, Soundcloud, or wherever you listen to podcasts. Craig Gorder climbing in Indian Creek Canyon, Utah. Hummingbird Spire on the Bridger Jack formation. The accident was in the notch to the right. Photo by Brad Brandewie. Gorder in the hospital with the dented helmet that he believes saved his life or prevented a serious head injury. Bill Wright and Tom Karpeichik were attempting a bold challenge in Colorado's Eldorado Canyon: Climb 100 guidebook pitches in a single day. To cover all that ground, they planned to simul-climb most of the way. Early that morning, four pitches up a 5.8+ route, Tom broke a hold on 5.5 or 5.6 terrain and fell, 50 feet above his last piece of protection. In this episode, Wright describes the monster, unbelayed fall that followed, how they both survived, and the lessons he took home. Read the original Accidents in North American Climbing report: publications.americanalpineclub.org/article…te-Park. Find this episode at iTunes, Soundcloud, or wherever you listen to podcasts. Bill Wright scrambling in Boulder Colorado's Flatirons. Eldorado Canyon, Colorado. The accident occurred on Redgarden Wall (left). Matt Olsen and Ty Guarino were attempting the Grand Traverse, a difficult linkup of the Tetons' seven central summits, with many miles of scrambling and technical climbing. Soon after leaving the summit of Teewinot, the first peak of the traverse, they had to make a couple of rappels into a notch. As he was rappelling, Guarino's rope pulled off a huge block that shattered around him. A chunk of rock hit him on the forehead and caused him to lose control of the rappel. Ashley speaks with the two men about the accident, their impressive self-rescue, and the lessons they learned. Find this episode at iTunes, Soundcloud, or wherever you listen to podcasts. Matt Olsen, left, and Ty Guarino on Teewinot, before the accident. Ty Guarino in the escape couloir. By late April, Marcus Mazzaferri had already hiked nearly 1,000 miles of the Pacific Crest Trail. He was just about to stop for the day near Tuolumne Meadows, high in Yosemite National Park, when he came across a swollen creek. He decided to cross it before setting up camp. What happened next left Marcus all alone, with no gear, 15 miles from the nearest road. His story will make you wonder: What would I have done? Marcus at the start of the Pacific Crest Trail by the U.S.-Mexico border. A much-anticipated breakfast after escaping the Yosemite backcountry. In this special episode of the Sharp End, Ashley speaks with Ryan Montoya, a 23-year-old student who had the strength, skill, and fortitude to survive a terrible mountaineering accident on March 15, 2017. Just below the summit of 14,018-foot Pyramid Peak in Colorado, during a solo winter ascent, Montoya fell more than 1,500 feet down the remote east face, then made his way back toward the road over the next three days, despite serious injuries. We've given extra time to this episode to let Ryan tell his amazing story in full detail. Montoya's ascent route on Pyramid Peak. The line of Montoya's fall down the east face of Pyramid. He had climbed the opposite side of the mountain. Montoya's escape route after falling down the east face of Pyramid Peak. Despite his injuries, he eventually made his way back to the road where he had started. Experienced mountaineers Jen Staufer and Adam Vonnahme were descending 14,294-foot Crestone Peak in Colorado when Jen slipped on an unexpected patch of ice and careened about 150 feet down the Red Gully, sustaining multiple injuries. Right before the climb, Jen had told her friend Adam that she was 10 weeks pregnant. In this episode, Ashley chats with Jen and Adam about the climb, the accident, and the dramatic nighttime rescue that followed. This incicdent was documented in the 2016 edition of Accidents in North American Climbing: publications.americanalpineclub.org/article…1214127. Find this episode at iTunes, Soundcloud, Google Play, and many other podcast services. Jen Staufer on the summit of Crestone Peak before the accident. Adam Vonnahe on top of Crestone Peak. Solid line shows the upper Red Gully descent to the point where Jen slipped on the snowfield. Arrow marks the point where she stopped sliding. ePISODE 15: WATER IN THE HOLE! Skander Spies, a volunteer with Denali National Park's climbing rangers, had just headed out on patrol on the Kahiltna Glacier. Although they didn't know it yet, the rangers would record eleven separate crevasse falls that day. One of these was Skander's, and his incident was scarier than most. Spies landed in a deep pool of ice meltwater at the bottom of the slot, facing extreme risk of hypothermia as well as the usual difficulties of crevasse rescue. Listen to this episode on Soundcloud, iTunes, Google Play, and many other podcast platforms. Skander Spies exits a crevasse in Denali National Park. Spies warm and dry in southern Utah. In this story from the mountains near Steamboat Springs, Colorado, a nighttime search for two lost skiers takes a dramatic turn when one of the rescuers is caught in an avalanche. Amazingly, the team from Routt County SAR not only bring their injured teammate home, they also bring out the lost skiers. Rescuer Jay Bowman, who badly broke his arm in the incident, talks with Ashley about what went wrong—and what went right! Listen to this episode on Soundcloud or find it at iTunes, Google Play, or Stitcher. Raf Andronowski is a highly skilled ice climber, photographer, and gear reviewer (thealpinestart.com) who lives in the Canadian Rockies. However, as we learn in this episode, even the most experienced climbers may have a lapse in judgment...with painful consequences! Partway through Episode 13, Raf and Ashley discuss an informative blog post by the well-known ice climber Will Gadd. Here's the link. Raf Andronowski waiting for help at the base of Carlsberg Column, outside Field, British Columbia. Listen to this episode on Soundcloud, iTunes, Stitcher, or Google Play. Medics attend to Andronowski's ankle before he is helicoptered to the hospital. On November 12, David had just finished a two-pitch climb outside of Joshua Tree National Park in California. From the top, he lowered his partner to a big ledge so she could walk off. He then decided to downclimb to the ledge without a belay. In this episode, David describes the accident that followed with remarkable self-awareness and good humor. David recovering in the hospital. Around sunset on November 7, 2015, Angela Uys (26) was at an anchor partway up Snake Dike on Half Dome, preparing to rappel. Her tether system was not effectively clipped to the anchor, and when she weighted the system it failed. She fell approximately 500 feet to her death. In this episode, Ashley speaks with Yosemite climbing ranger Jesse McGahey, who responded to and investigated this tragedy. Half Dome from the southwest, the face climbed by Snake Dike. Ranger Jesse McGahey at work in Yosemite Valley. Listen to this episode on Soundcloud or find it at iTunes or Stitcher. Read the original report on this incident in Accidents in North American Mountaineering 2016. Climber and backcountry skier Steven Lozano summited Mount St. Helens with a friend on a beautiful April day. Two climbers soon joined them on top, and one of them, who was making his 69th ascent of the mountain, asked Steven to take a photo of him with Mt. Rainier in the background. What happened next will be seared into Lozano's memory forever. A photo from the U.S. Forest Service climbing webpage for Mount St. Helens, showing the cornice dangers along the crater rim. Sharp End guest Steven Lozano shows off his homemade recording studio. Steven Lozano (left) and Kurt Williams. Joe Bohlig climbing in Ecuador. Listen to this episode on Soundcloud or find it at iTunes, Google Play, or Stitcher. Read the original report on this incident in Accidents in North American Mountaineering 2011. Click on the photos to listen to previous episodes! Episode 5: Bomber Anchors or Time Bombs? Send us your comments and story ideas at [email protected]!